Firstly, the story behind the photo above, a story which shows at least how intelligent our Squirrel friends, or foes, are! I noticed they had been at the Bird Feeder hanging on the tree opposite the Kitchen Window, so I went outside, noticed it needed some small repair work and took it into the Kitchen to mend. 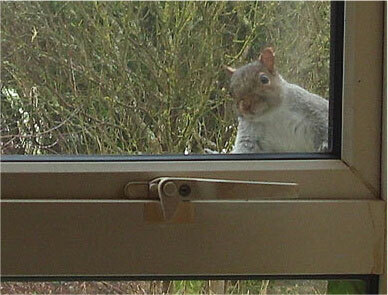 There I was, busy bending wire and squeezing back into shape when I had that feeling someone's watching me. I looked up and to my amazement, the Squirrel had seen me take the Feeder away, obviously saw or heard me in the Kitchen and popped over to see what was going on! If one thinks the Fox is shrude and coming, they need to turn their attention to Squirrels, one of the most amazing survivors of the modern environment. 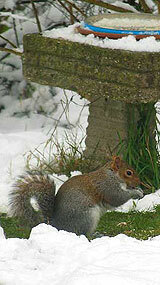 There are an estimated 2 million in the UK, the Red Squirrel though only accounts around 120,000. If anyone wants to blame anyone for them, it's the Americans! They were brought over mid 19th. century. No one seems to know the exact reason why. 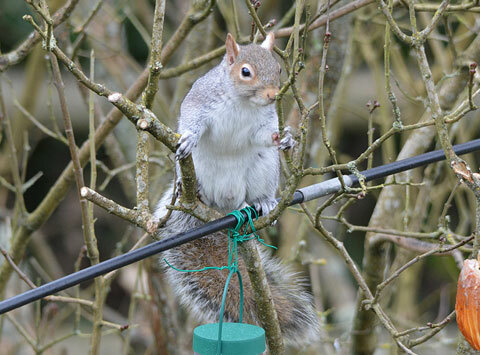 They are still officially classed as a pest, but surely they are one of those respected pests; they will pinch the Nuts off trees faster than you can pick them, then burying them in your Lawn to untidily dig them up through Winter, they will raid Bird Feeders and any other scraps left out. The only sad thing is they can sometimes take eggs from Bird's Nests. 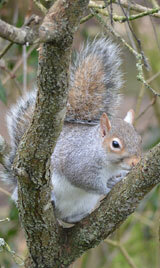 They live mainly in their own nests built high in trees. Most rural Squirrels are pretty shy of humans, but many living in well attended Parks can be fairly tame and gladly be fed the odd crust of a sandwich by hand. Females can mate and breed twice a year, an average yield is two babies. The young will stay with their Mother for a period of about 2 to 3 month's, they will venture out to find homes of their own. Love them or hate them, they amusing to watch and as far as survival goes, we could learn a lot from them! 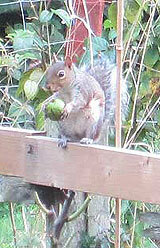 Squirrels- forever scrounging, well more thieving really! And hold a nut between your toes. Another mid winter breakfast in store!